I'm in the process of trying to grow back a few evergreen clematis vines after a hard pruning (it was top heavy & becoming a tangled mess). I read about pinching my vine to encourage branching. Unfortunately, I foolishly thought this meant split branching on the end where I pinched. I've since come to understand the branching is more likely to occur on the already established stem. 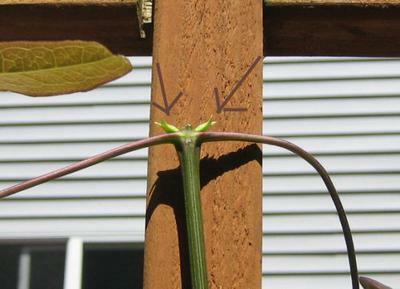 My problem is that I think I've stunted the growth of my clematis! My plan was to have what I thought would be the 2 new vines grow in opposite directions to lay flat along a wide trellis....now its just growing in the middle shorter than I had intended. My new plan is to let vines from the others grow really long & train them to grow along the width of the trellis. My hope is that I didn't stunt the growth of the center vines. Please disregard the 2 tangled messes at the top. I've pruned those hard & will remove those soon. Is there anyway to get the main stem to start shooting new leaves again or have I permanently stunted my vine? I'm so mad at myself for not realizing what I did. I hope you can help me. Hi Carolyn - it looks like you've done exactly the right thing. 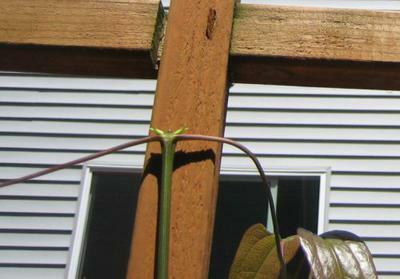 In time, say a few months, the new buds that are emerging (see picture 3) will grow out to form new stems. Your vine looks very healthy and happy, and it must be exactly the right conditions. 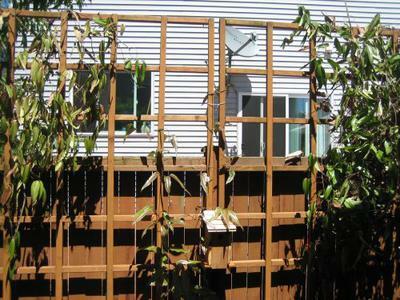 Judging from the view behind the trellis, this vine will provide much needed privacy, for you and your neighbor. Have patience, and keep doing what you're doing. You can find more information about growing these vines here on Daves Garden Website.